Common Core Standards met in this lesson: RI.9-10.1, RI9-10.2, W.9-10.2, W.9-10.4 (see details below). •Explain what a sabil-kuttab is. •Place the sabil-kuttab of Sultan Mustafa III in historical context. •Piece together and write the story that the sabil-kuttab tells. •"Listen" to another building and tell its story. How does a building speak? When writers Agnieszka Dobrowolska and Jaroslaw Dobrowolski say that historic buildings speak, they don't mean the buildings literally speak. If you go to an old building, you're not likely to hear its walls utter words or its pipes tell you stories. What, then do, the authors mean when they say buildings speak? Think about all the things you see every day that tell you something—that give you information— without even speaking words. Here are a few examples: If you see someone wearing sunglasses, what do the sunglasses "tell" you? They might tell you that it's probably sunny in the place the sunglasses wearer is. If the same person is wearing a heavy wool coat, it is reasonable to assume that it's cold there, too. As a class, brainstorm some other examples of objects that "speak" to you, providing information in non-verbal ways. Remember this way of communicating while taking a brief detour to make sure you understand some basics in the article. 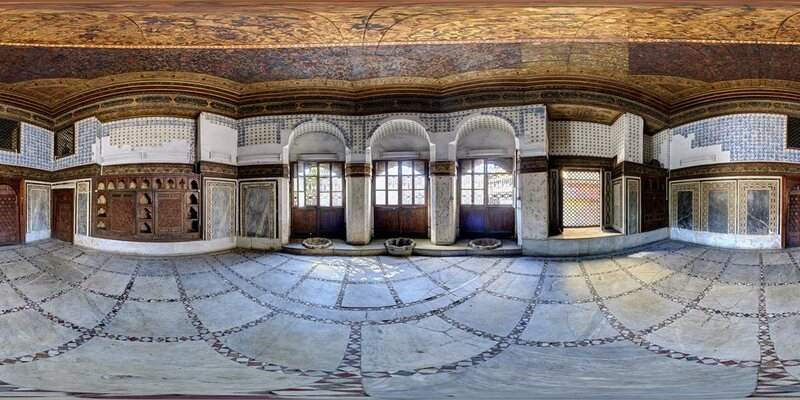 a 360-degree image is flattened to show the floor-to-ceiling intricate detail in the sabil-kuttab. To understand the building that the article focuses on, start by getting to know a few basic facts. Think of them as the foundation, not of the building itself, but of your understanding of the building. Here are a few questions to answer. You can write down answers, or talk about them with a partner or group? •What purposes do they serve? •What was unique about them in Cairo? Now that you've answered some of the "what" questions, turn your attention to the "when" questions. Make a timeline that starts in the 1200s and ends at 1800. As you read the article, write below the timeline the important dates for political events and the reign of leaders. Start with the following: What happened in 1517? What was going on in the 250 years before 1517? Then, above the timeline, note key events such as the construction of specific buildings that were cultural. Be sure to include—and highlight—the sabil-kuttab of Sultan Mustafa III. In addition to specifics, label larger cultural influences. Such influenced are not tied to a specific date, but rather to a period of time such as the era in in when Mamluk or Ottoman influence was particularly strong. "The Sultan's Fountain" describes both Mamluk and Ottoman architectural features. Which are which? As you read this part of the article, clarify your understanding by filling in the T chart below. Highlight the features that Sultan Mustafa III's sabil-kuttab included. Think back to the original premise of the article—that buildings can speak to us. Whad do this buildings features tell you about what was going on in government and culture at the time it was built. Yet another way that buildings communicate with us is by where they're located. What does the article say about the building's location in Cairo? Where was the building relative to the canal and to other buildings? What does the location reveal about the political climate at the time the sabil-kuttab was built. Choose one of these options as a culminating activity. 1. What does the sabil-kuttab tell? Write it in a one-sentence summary. Then use that sentence as the thesis of an essay in which you use evidence from the article to support the accuracy of the story you have identified. 2. Spoiler alert: If you want to start with a thesis in hand, here is one you can use. If you're going to generate the story yourself, stop here! If not, here's your thesis: The sabil-kuttab of Sultan Mustafa III tells a story about how two cultures co-existed in 18th-century Cairo. If you're intrigued by the idea that historic buildings can speak, try listening to another historic building. Identify such a building that you're familiar with—perhaps one near your home and/or one that you've visited. Find out when it was built. What was going on politically at the time. (These are the kinds of events that would be added under your timeline.) What was going on culturally? (This is the kind of information that would be added above your timeline.) Within the political and cultural contexts, what does the building say? Write your answer as did for the sabil-kuttab. RLI.9-10.2 Determine a central idea of a text and analyze its development over the course of thetext, including how it emerges and is shaped and refined by specific details; provide an objective summary of the text. W.9-10.4 Produce clear and coherent writing in which the development, organization and style are appropriate for the task, purpose and audience.